Traditional design beige color embroidered Indian Babu moshai cotton dhoti kurta - worn typically in Bengal (India). Both the dhoti and the kurta are beige in color with Embroidery in brown and yellow thread all over the kurta and at the cuffs of the sleeves. 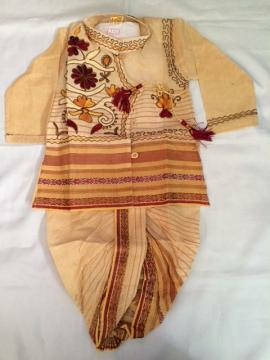 The dhoti is ready-to-wear, and has a colored border at the base and on both legs. Ideal for durga puja and other festival celebration. Available for boys aged 1 to 4 year old.Please note that the actual embroidery may be different than in the picture. This item in Dhoti Kurta for Kids category was first added to our catalog on 10-01-2016. Buy Bengali Style Beige Readymade Dhoti Kurta For Children, sold & shipped by desiVastra.com where you can shop online for Traditional Dress for Baby Boy & Girl, Indian ethnic Wear for Kids. This Kids Dhoti Kurta collection has been tagged as Readymade Dhuti Kurta, Toddler Clothes, Children Indian Outfit, Baby Boys Apparel, Indian Clothing, Indian Outfit Online.